Cox’s Bazar (Bangladesh): Residents of Chikanchari in the troubled Rakine state of Myanmar had a miraculous escape from a killer squad of Rohingya militants who had butchered inhabitants of neighbouring villages. After a long march from their village, they arrived at Bangladesh’s Cox’s Bazar where thousands of Hindus and Rohingya refugees had already migrated from the neighbouring country after the violence that was unleashed on 25 August last year. The tales narrated by the inhabitants of Chikanchari have been corroborated by a report released by Amnesty International which names the Arakan Rohingya Salvation Army (ARSA) or Harakah al-Yakin as having carried out the carnage resulting in the death of 99 persons from Hindu villages in Myanmar’s Rakhine state. This group of refugees, who are currently putting up at a camp at Kutupalong in Cox’s Bazar, were among the 600-800 Hindu refugees uprooted from their homes in Rakhine state. Another migrant in his early twenties said that there were rumours in the village of an impending attack by the rebels since “Alekin” had already stepped up its activities in the region from the past couple of years. He further said that nobody in the village had envisaged that the raid would be so swift and devastating. “There were about 100 people in the group armed with guns, bombs and knives. They attacked Murung (Buddhist) villages as well. Now, there is nobody left in our village. But this group did not attack Muslim villages,” recounted Surodhan Pal. The camp inmates at Kutupalong also said they are keen to return to Myanmar and settle at any place except in their village, since they are certain that it would be difficult to restore cordial ties with their Rohingya neighbours. According to one version, the origin of ARSA can be traced to a meeting in Saudi Arabia convened at the fag end of 2010. In this meeting, Rohingya expatriates decided to set up a new organisation that would be different from the previous groups like the Rohingya Solidarity Organisation (RSO) that had fallen into disrepute for inaction and sleaze. In the meeting, it was decided to appoint a cleric named Ataullah Abu Ammar Jununi alias Hafiz Tohar as the leader of the new outfit. This group soon underwent training at a camp of Lashkar-e-Toiba in Pakistan. Harakah al-Yakin (as ARSA was known earlier) began organising training camps in the Rohingya-inhabited territory in Rakhine state in 2016. A majority of informers from all communities were systematically executed to deprive the Myanmar military of information on its activities and future plans. The outfit was flush with funds but suffered from a dearth of weapons, which explains the crude bombs and country-made guns used in the attack on police outposts on 25 August last year. 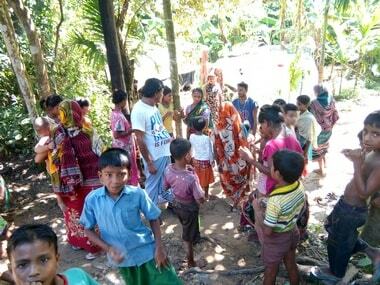 According to reliable sources, several ARSA cadres have landed up at the refugee camps in Bangladesh’s Cox’s Bazar and especially at Shamlapur where earlier batches of Rohingya migrants have been accommodated. The Myanmar government has already handed over a list of over 1,300 ARSA rebels to Bangladesh who have supposedly taken refuge in the camps and the surrounding region. Most of the residents of Chikanchari this correspondent spoke to said that they had cordial relations with their Rohingya neighbours in Myanmar’s Rakhine state. However, they were at a loss to understand the reason that drove the ARSA to attack the Hindu villages. Surodhan Pal claimed that the ARSA carried out a campaign in the Rohingya villages to drum up support for their plan to attack the Hindu and Murung (Buddhist) villages. Unlike the Rohingya, whose movements were severely restricted, the Hindus were holders of the “green card” in Rakhine state, which has given them access to jobs, education and health facilities. According to a reliable source, the Hindu villages came under attack after a few senior residents of some villages rejected ARSA’s offer to join hands in operations against the Myanmarese security forces. They came under the suspicion of being close to the military and collaborating with the local Buddhists. Unlike Rohingya outfits of the past, ARSA was founded in a foreign country and some of its top functionaries are based in West Asia and South East Asia. In a statement in last September, ARSA has not only denied links with al-Qaeda and Islamic State, but also warned foreign fighters against entering the conflict zone. However, there are inputs and reports indicating the presence of foreign trainers in the outfit and a section of the intelligence communities in India and Bangladesh believes that it has links with foreign terrorist groups as well. Some analysts are of the view that ARSA had also firmed up plans to implement an Islamist agenda, which, however, remains uncertain in the existing circumstances in Rakhine state. ARSA has been unable to sustain its armed campaign against the Myanmar military after the attack on 25 August last year. An elderly Rohingya migrant at one of the camps in Nayapara claimed that ARSA’s campaign was coloured with religion from the outset. He was of the view that the training modules, which were mostly held under the cover of darkness in Rakhine state, also aimed at fomenting hatred and distrust against other communities like the Hindus and Buddhists.